According to a Human Rights Watch report, hundreds of Palestinian youths, some as young as 11, are being employed on settlement farms. The work is hard, and conditions even harder. Three youngsters describe an average workday. Around 5 A.M., before sunrise, a Palestinian in the Jordan Valley leaves for work. There’s not much time. He has to reach the junction a few hundred meters away by 5:30. From there, he’ll go to work in one of the area’s Jewish settlements. Some go by foot, others in a vehicle usually belonging to a Palestinian subcontractor. They gather at the Moshav Tomer entrance, hop on a big wagon tied to a tractor, and head down a dirt road toward the vineyard. Among the workers are Yusef, Mohammed and Ali, all aged 14-15. The boys use fake names out of fear of retribution from their employer. Others on the crowded wagon look even younger. It’s hard to know for sure, but no one’s checking. Moshav Tomer’s security guard stands watching on the side. The workday begins. Not even the Palestinian middlemen are concerned by the children’s ages. Their ability to survive economically depends almost entirely on working in the settlements. In April, Human Rights Watch issued a 74-page report (“Ripe for Abuse: Palestinian Child Labor in Israeli Agricultural Settlements in the West Bank”), stating that the settlements, primarily ones in the Jordan Valley, employ hundreds of Palestinian youths, many of them under the age of 15 (the legal working age). The law places several limitations on how many hours children can work daily or weekly, and the type of labor. It’s hard to find observance here of the laws and local regulations, as well as the United Nations and International Labor Organization conventions to which Israel is a signatory. The lack of registration and supervision is part of the Israeli system of control, and allows those involved to close their eyes. It seems the settlements prefer it this way. The Human Rights Watch report was based on interviews with 38 children and 12 adults conducted in 2014. All of them were working in agriculture at various Jordan Valley settlements. The NGO also interviewed subcontractors and a number of educators in the region. Among the minors, 30 said they started working before age 15, most of them when they were 13 or 14. The youngest boy interviewed, who worked part-time in settlements, was 11, but one mentioned working alongside a 10-year-old. The report estimates that at the height of the harvest season, upward of 1,000 youngsters work in the settlements. A workday can last 10-12 hours at this time. The work includes picking, cleaning, sorting and packing produce such as grapes, tomatoes, sweet peppers, onions and dates. According to some of the children, they suffered from vomiting, dizziness and rashes after the crops were sprayed with pesticides. They had almost no protective gear to wear. Others spoke about extended work hours during the summer, while they were on vacation from school, and of temperatures reaching 40 degrees Celsius – and it was even hotter in the greenhouses. If UN food stamps aren’t enough or aren’t stolen from reports, by HAMAS, if there aren’t fathers to that are able to provide familial support, this is what happens to children in all countries, including the US. The middlemen take a percentage of the earnings and ‘supervise’ the child workers. The UN may take the moral high ground (as do many) but the UN hasn’t done much of anything to prevent the underlying issue’s that are the cause of child labor in countries. We in the US can’t take the moral high ground either when in effect the legislation sits in committee in ”Congress H.R.2764 Latest Title: CARE Act of 2015” and people Howled, loudly, including some politicians, ever since 2009 when the first upgrade was introduced (that I know of) . So the Obama Administration took somewhat of a type of action but the pit of the matter rests in States and their legislators refusal to change their child labor laws. They aren’t talking about three children either, they are talking about hundreds of thousands of US children. Hello, dear friend. Thank you for your poetry. The report estimates that at the height of the harvest season, upward of 1,000 youngsters work in the settlements. A workday can last 10-12 hours at this time. The issue here isn’t about the numbers of children been exploited either. Numbers are meaningless. The laws being violated aren’t just international laws and human rights standards, but Israeli laws. The issue is about the hypocrisy of Israelis who refer to Palestinians as uncivilized animals even while using their children as farm animals to enrich themselves. Sound familiar? That whole subhuman/plantation thing? 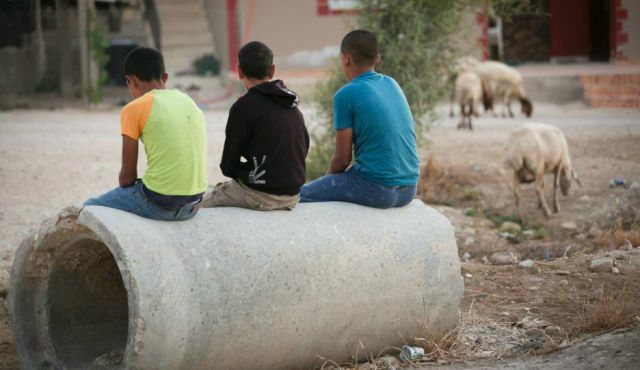 Hamas is not even an issue in this debate, because this report is about the exploitation of Palestinian children by Israeli farmers in the West Bank–which is occupied and policed by Israel and nominally governed by the Palestinian Authority–in areas that have been illegally settled (stolen from their rightful Palestinian owners) by radical, fundamentalist Jews. The United States, the United Nations, and the entire civilized world, for that matter, does not recognize the right of Israelis to occupy and settle these areas. The Nazis in Germany demonized the Jews and stripped them of their most fundamental human rights even while employing them as slave laborers to enrich themselves. The issue here isn’t about the Nazis, Israel, Hamas or any other group; It is very much about the deep logic of oppression. The political and social disenfranchisement of minority peoples by those engaged in their economic exploitation is a major recurring theme in human history. There is a very familiar pattern of abuse being perpetrated here. Sad but good article. The fact Israel is doing little to nothing to stop this from taking place by enforcing its own laws is disappointing but not surprising. Israel would never stand for Israeli youth being treated in such a way but Palestinian youths being mistreated and they don’t seem to care much. Similar things are happening to Syrian and Iraqi refugee kids. There is many refugee children and youth being used for hard labor especially in agriculture. These kids have been through so much pain and heartache as is, only to be taken advantage of by selfish and greedy employers. Some of the children face sickness made worse by the hard conditions and many of them are abused and poorly treated. One thing that is not often mentioned but can’t be underlined enough is many of these children’s parents willfully allow their children to work hard labor as they are desperate for income. I realize these employers probably lie and don’t live up to promises they make with the parents but still it is wrong what the parents or guardians have done. With the orphans the problem is they have no one to care for and advocate for them. There is too many kids without parents or guardians or at least without supportive and active ones. This makes these kids much more vulnerable to being taken advantage of. As far as child labor in the US, we indeed have it especially in agriculture involving undocumented migrants. It has been poorly covered in the media and rights groups have not focused enough on it, but it is happening here. There is also many U.S. companies who knowingly overlook child labor in the production of their goods overseas. Lastly we import many goods and crops into the U.S. where very likely child labor was used. These kids are being forced to grow up fast. They may be the family’s sole provider as the father may be ill, absent, or dead. The mother is at home caring for their younger siblings. They are often living in desperate poverty and in desperate situations. They may be orphans without parents or guardians and live on the streets or with whoever will give them shelter. They see it as what they have to do to survive. These kids are being neglected by society so they turn to people promising them money and opportunity only to be abused and taken advantage of. We have to do more to address poverty and societal issues that are at the root of such problems if we are to truly help these kids have a better life. All the laws and enforcement in the world will not solve this and similar issues until we go after the root causes and contributing factors. We too often look in the wrong places for solutions or easy fixes. When the fix will require years and decades of commitment conquering poverty, inequality, and corporate wrongdoing. It will require a lot more compassion than we have shown in the past. It will require government reforms and neighbors helping neighbors. Most of all it will require changing hearts and minds which is perhaps the most difficult task. It is not so often that a father is missing from the home in the case of the Palestinians rather than the economic needs of the entire family are so great that even the children will sacrifice themselves. If the options for their children and themselves are starvation, illness and death, then it is difficult to blame the parents too much. It was easy enough for Americans to be outraged at a family of Iraqi refugees prostituting their 5-year-old-daughter in the markets of Damascus out of sheer economic desperation. The roots of the suffering in Syria and throughout the region today are in no small part the result of our illegal and unnecessary war in Iraq. Too bad that we didn’t shoulder such high-minded moral ideas when we agree to that horror sold to us and perpetrated by evil men.